We were running low on white printer paper (I didn’t realize this until after I came home from the store, natch) so I cut the unprinted white parts of some junk mail envelopes into squares, folded the paper, and then went to town with the scissors. It's been quite a while since I made snowflakes, but they got better as I made them. The woven heart baskets are a Danish tradition. Danes hang woven heart baskets on the Christmas tree and fill them with candy instead of putting candy your socks like the American tradition. You can make woven heart baskets out of felt or paper. I made my woven heart decorations out of red wrapping paper that is white on the backside that I already had in my wrapping paper stash (and is recyclable in my city.) Since I was going to hang the woven hearts in my windows, I didn't make baskets; I just wove the two pieces of paper together. I think I like this idea better than my original idea because it’s unique, I get to share a little bit of my ancestor’s tradition with my family and neighbors, and the price can’t be beat - free. 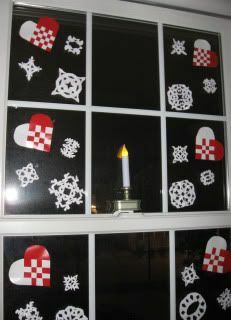 Now pardon me while I fire up a batch of Glögg * to drink while I admire my Danish American Christmas window decorations. *Literally. We Scandinavians like to light our spiced holiday bunch on fire before we drink it! (We come from Viking marauders, you know.) Skål! What a cool idea! I love that you put junk mail to good use before tossing it into the recycling bin too. I'm a minimalist when it comes to decorating (out of sheer laziness) but your simple idea inspires me to think of what could be done with a little ingenuity and reused paper. Thanks for joining us this Thrifty Green Thursday! Love it!!!!!! How did you put them on the windows?? Lisa - I could be cheeky and say that I attached everything to the windows with Christmas magic. In reality I used itty bitty slivers of clear tape, approximately 2-4 per decoration as needed. I usually go crazy making paper snowflakes, but I haven't made one this year. (And I've never made a woven Danish heart!) Your thrifty green decorations turned out beautifully! It's wonderful idea to decorate windows in unique way!! I just love the paper work!! Fantastic! !